I love to include seasonal ingredients in my smoothies. If summer is all about pinks, purples and reds (from fresh berries and cherries), then autumn is all about orange. Sea buckthorn, oranges, sweet potatoes, persimmons, and—yes, the ultimate autumn symbol, the mighty pumpkin—all are full of vitamin C and beta-carotene, nourishing our bodies and preparing us for winter. In autumn, pumpkin (and pumpkin spice) is everywhere. How about taking that fall favorite and turning it into a delicious, protein-packed healthy pumpkin pie smoothie? This one has a glorious color and incredible flavor—just like having dessert for breakfast! 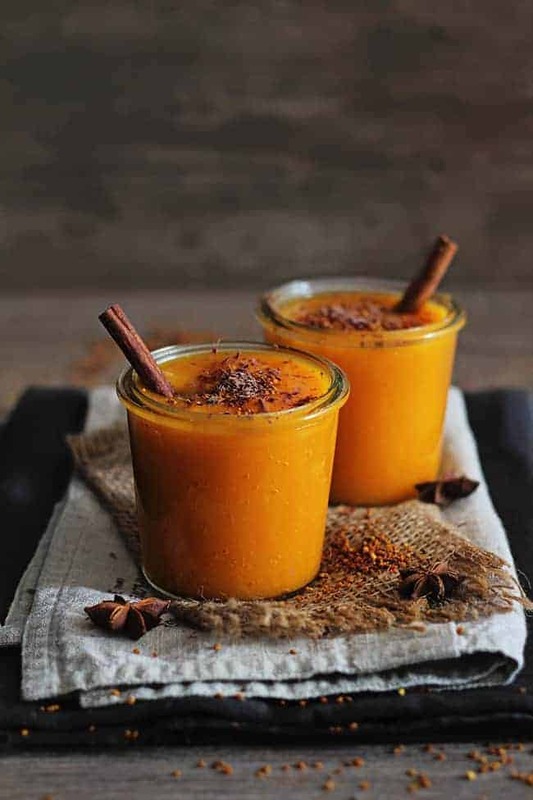 To assure the proper intake of beta-carotene from pumpkin, you should combine it with healthy fats like nuts, seeds or coconut oil; this smoothie has two of those! 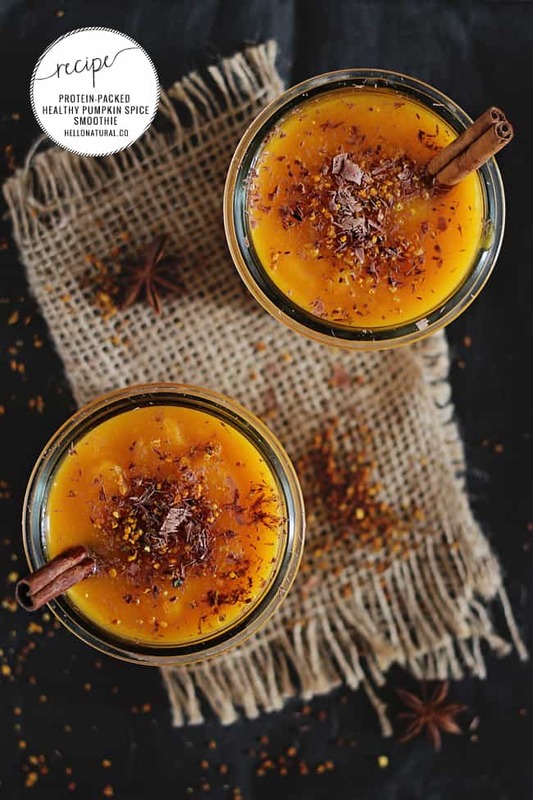 A pumpkin spice smoothie packed with protein, perfect after a workout but also as a healthy dessert or breakfast. 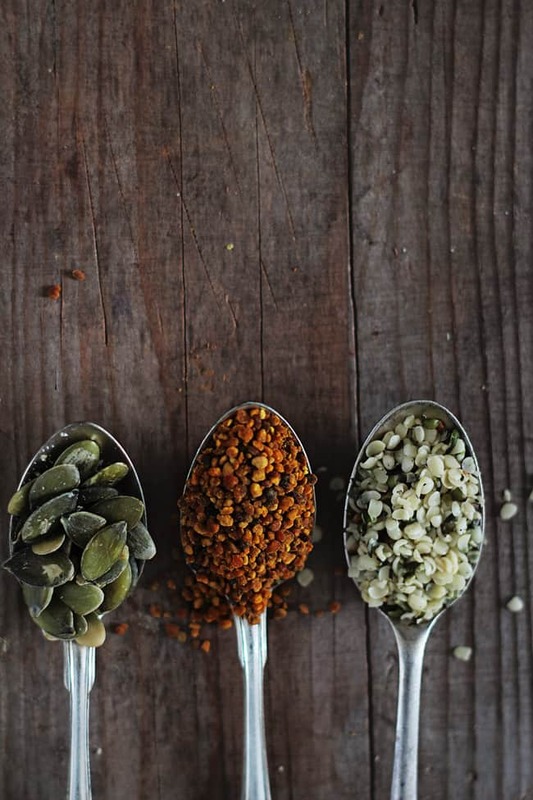 I’ve been looking for a way to incorporate raw pumpkin seeds! This recipe looks delicious and packed with protein! Love that this is a different way to use pumpkin! And I love a good smoothie! This recipe reads yummy! I’m starting to check out natural foods, etc. This is my first time on your web site, so I’m just wondering, since your recipe calls for “1 cup pumpkin, pureed.” can one use canned organic pumpkin (if such a thing exists)? Thanks! Looks yummy and refreshing! Never thought that a pumpkin would be this good for a smoothie. Definitely will try this. Thanks Stephanie. OMG, how good this shake should be! thanks! 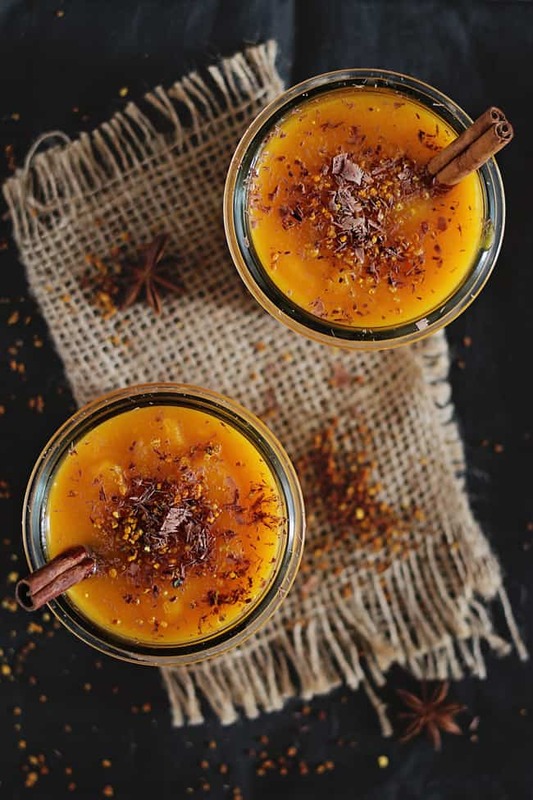 Never would have thought to make a pumpkin flavoured smoothie before.. great idea! Looks delicious and I love your incredible photography… Pinned! This is my kind of smoothie – it sounds sooo good!